The Minister of Internal Affairs, Varney A. Sirleaf, has reassured the commitment of the Government of Liberia (GoL) to protecting the facility of MNG Gold, a Turkish Mining Company operating in Korkoya District, Bong County, and its investment. Minister Sirleaf, at the same time, assured authority of MNG Gold that all those who recently vandalized the company’s properties will be dealt with in accordance with the laws of Liberia. The Internal Affairs Minister pointed out that as the Liberian government is doing everything to attract investment; it will not allow anyone, or group, to undermine the implementation of President George M. Weah’s pro-poor agenda for Development and Prosperity. Meanwhile, Minster Sirleaf extended condolences to the bereaved families. He, also promised that the Government of Liberia(GoL) will ensure a befitting entombment of the four motor accident victims. Minister Sirleaf described the death of the four persons as saddening and an irreparable loss to their families. The Internal Affairs Minister made the statements in David Dean’s Town in Kokoyah Statutory District, Bong County, where he went to intervene in the recent crisis between MNG Gold, a mining company, and citizens of the district. The crisis started in Saye-weh Town, at about 4 P.M. on Monday, November 5, 2018, when a vehicle which is said to be owned by a Chinese company allegedly hired by the Turkish Mining Company (MNG-Gold) accidently killed four persons. The driver of the company’s vehicle reportedly escaped the scene of the tragic accident for fear of being killed by an angry mob that allegedly set the four-door Toyota land cruiser pickup ablaze. Some of the angry residents of the District later vandalized MNG Gold’s facilities and looted several valuables including explosives intended for blasting rocks at the Company operational sites. Investigation conducted by the INSIGHT established that about 30 persons suspected to be connected to the looting of the company’s facility have been arrested by the Liberia National Police (LNP) for investigation. The LNP has launched a vigorous search of the company’s looted properties some of which were said to have been discovered in the homes of some residents. According to INSIGHT’s Bong County correspondent, MNG Gold is facing a situation wherein its operation could come to a standstill for several months as some of its key mining equipment and other properties were either taken away by the looters or destroyed. It can be recalled that residents of Kokoyah Statutory District expressed dissatisfaction over the company’s handling of chemical wastes from its gold mining operations. The residents claimed that some of the chemicals recently spilled into nearby waterways and a well being used by students of a public school in the area. They citizens also alleged that some of the students who drank water from the contaminated well became sick and needed medical treatment. At the time, MNG Gold, through its spokesman, denied any wrong doing. 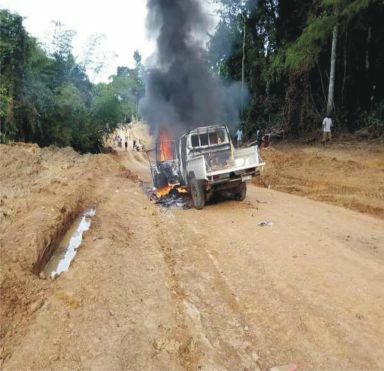 It may be recalled that Saye-Weh town in Kokoyah District, Bong County, was a scene of sorrow and weeping Monday afternoon, November 5, 2018, as a vehicle said to be owned by a hired Chinese contracted company, under the Turkish mining Company, MNG-Gold, accidentally killed four Persons. According to our sources, a motorcyclist, name not given, was ascending (climbing) a hill with three passengers (a girl and 2 boys) while the vehicle of the hired Chinese company was also descending (coming down the hill) when the motorcycle and vehicle collided along the road, leading to the instant killing of the bike passengers. The driver of the vehicle (name not given) escaped the scene of the accident for fear of reprisal from an angry mob. The angry residents of the area who trooped to the accident scene later set the four-door TOYOTA land cruiser pick-up reportedly belonging to the company ablaze. As a result of the killing of the four persons in the motor accident, some of the angry residents of the area broke into the facility of MNG Gold and made way with several materials including computers and accessories, chairs, among others. The aggrieved residents threatened to flog or severely deal with anyone who would resist them from entering the company’s operating site. However, our Bong County Correspondent disclosed that on November 6, 2018, the Liberian National Police (LNP), Bong Detachment, swiftly deployed some armed police officers to the area to contain the violence situation and ensure law and order. The INSIGHT also gathered that the LNP officers were conducting a house-to-house search for the materials looted from the company’s operating sites by the residents. The INSIGHT also gathered that in recent times, the people of Kokoyah Statutory District in Bong County have not been in good relations with MNG Gold which has been operating in the area. Our sources indicated that the people of Kokoyah statutory district are not satisfied with the workings of the mining company. A few weeks ago, there were reports that a well which is being used by students of a public school for drinking in the area was allegedly contaminated by dirt and chemical from MNG Gold operating site. Some of the residents claimed that as a result of the well contamination, several students of the school became sick. At the time, the school students launched a peaceful demonstration, calling for the relocation of the school and the medical treatment of the alleged chemical affected public school students. The protesting students, and residents, at the time, also called for thorough investigation of the alleged well contamination situation for appropriate corrective measures.